The group stage for the first ever FIFA eNations Cup has been set following the official draw that took place yesterday. Featuring 20 of the world's top FIFA esports teams from across all six confederations (CONCACAF, CONMEBOL, CAF, OFC, AFC and UEFA), the inaugural FIFA eNations Cup will take place in London on April 13th and 14th. It will see 20 nations competing to win the title and for a prize pool totalling $100,000. The draw comes after the official eLions representatives were confirmed. UK FIFA players Donovan ‘F2Tekkz’ Hunt and Tom Leese (pictured) will be playing for the eLions in the Xbox One and PS4 categories respectively. Earlier this month, it was revealed that tournament organiser ESL had teamed up with the Football Association (FA) to find FIFA players to represent England. You can read more about the eLions player tournament here. 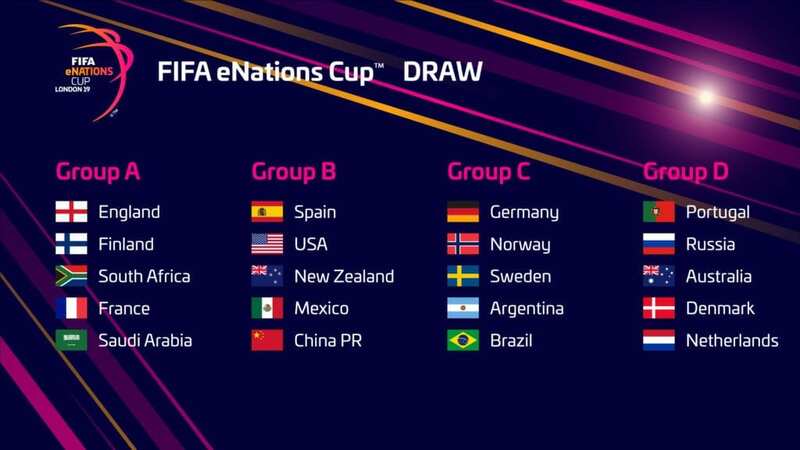 As part of the format of the first-ever FIFA eNations Cup, participating nations and players will compete in individual (1v1) and team (2v2) matches across both consoles during the group stage. The top two nations in each of the four groups will progress through to the knockout stages.